Market Lavington Museum, only accepts gifts when it comes to new acquisitions. However, there are several local benefactors who are willing to buy some items and then give them to the museum. None of them are rich people – they just want the best for the museum. They are willing to pay a pound or two for an item that would be of interest. 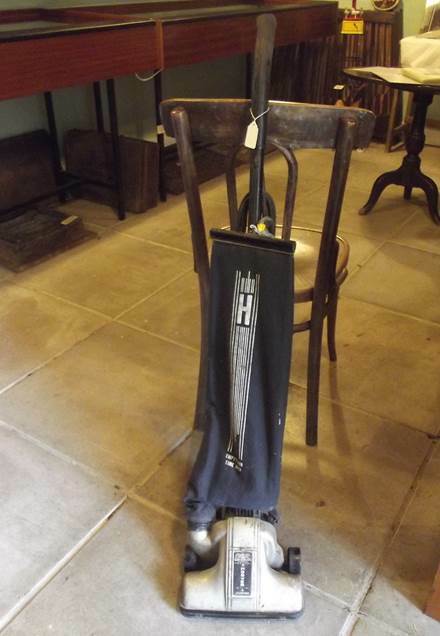 In past times, a chief benefactor was Peggy Gye and one of the items she bought was a vacuum cleaner. 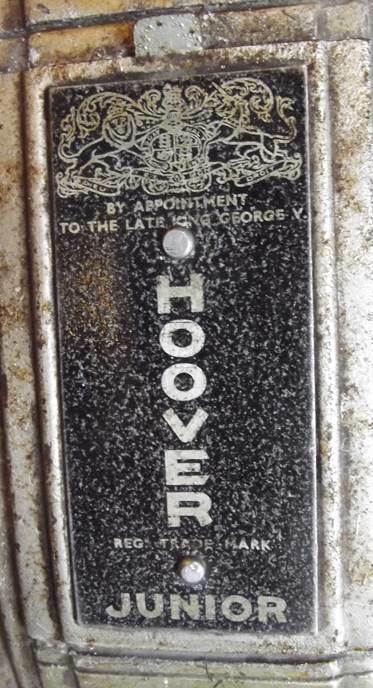 It’s a pre-war Hoover Junior upright cleaner. There it is. It’s leaning against a chair because the clip that holds the handle upright doesn’t work. This cleaner dates from around 1937 which means it will be 80 in three years’ time. It was in use, in Market Lavington until some 35 years ago and had been fitted with the more modern square pin 13 amp style plug. Then, in the early 80s it was offered for sale at a charity auction for a local school. Peggy bought it and paid the princely sum of 10p for it. It became a museum item when we opened back in 1985. The rather pitted maker’s plate gives a good clue to date by being ‘by appointment to the late King George V. He died in 1936. 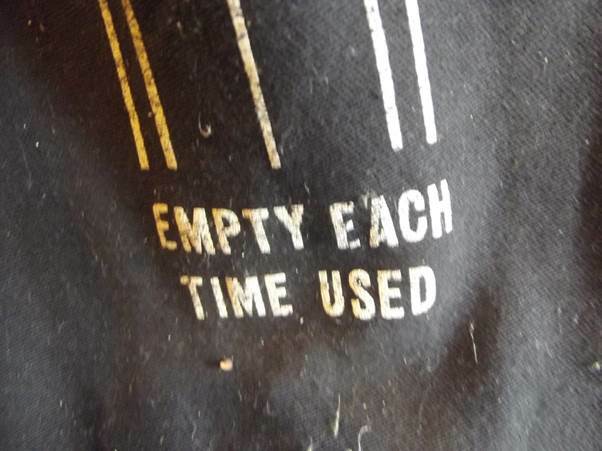 The dustbag (no paper ones in those days – let alone cyclonic collection) had to be emptied after each usage. This is being written as I drink a mug of coffee, with water boiled in a very cheap, largely plastic kettle which, of course, plugs straight into the electricity supply and boils water very rapidly. Now go back 100 years, to a time before mains electricity arrived in the Lavingtons and there was no cheap plastic. Your kettle had to be made to withstand the heat of a fire. Essentially, it had to be metal. Most metals were not all that easy to beat or bend into shape and then make joints which had to be waterproof and heatproof. The ideal metal was copper. 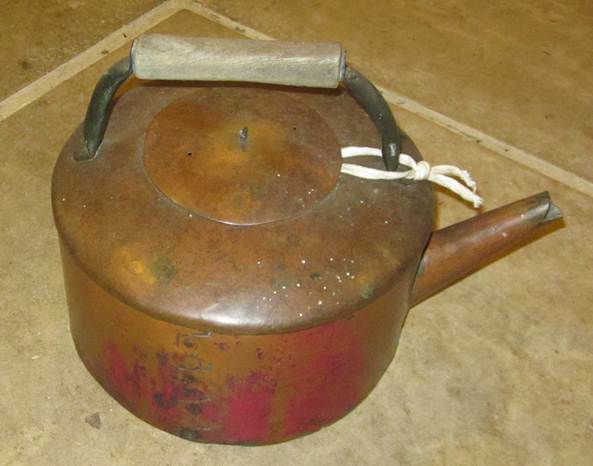 Our curator tells us that in the 1970s he and his wife tried to make a copper kettle. They attempted to beat a sheet of copper into a hemisphere to make the top of the device. He believes they still have the resultant attractive copper dish somewhere. In those harum-scarum 1970s days they never found the time to complete the project and, in any case, they had an electric kettle to use. Back in the 1900s, the options were more limited and a Market Lavington copper smith completed a kettle of simple, attractive appearance. This kettle has been made in several pieces. It has a sturdy base. The side is made of a single sheet of copper bent round. The top is another single sheet, beaten into shape. There is a handle (made of steel with a wood grip) and a spout. It should have a wood knob on the lid but that is missing. The kettle was clearly designed to stand on a kitchen range, which is just what it does at Market Lavington Museum. The method of jointing is interesting. We guess it was a brazing method, but we can see how surfaces were overlapped to ensure good contact and closure. That’s the seam in the kettle side wall. 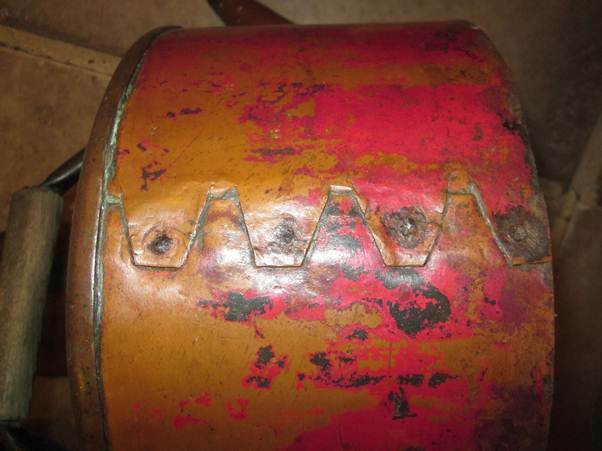 Clearly it has been riveted as well, probably before brazing took place. The kettle was given to the museum by a White Street (Market Lavington) resident. 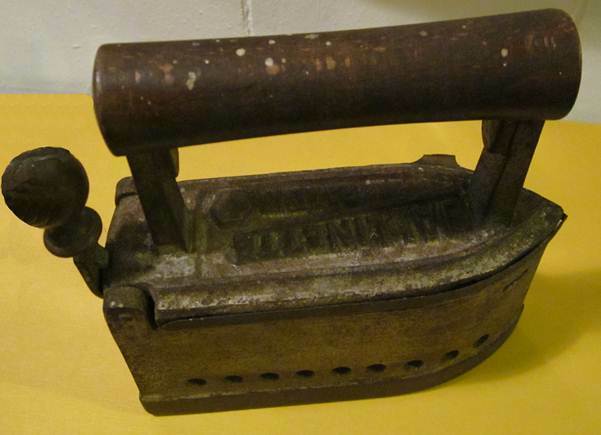 Before electricity, getting creases out of clothes was a job for the flat iron. These were heavy chunks of metal which were placed on a stove to heat up. When they reached what was deemed a suitable temperature they were used to press out the creases from the washing process. Meanwhile, if you had two such irons, a second one was warming on the stove. Alternatively, you could have a Dalli or, as we have at Market Lavington Museum, its smaller version, the Dallinette. 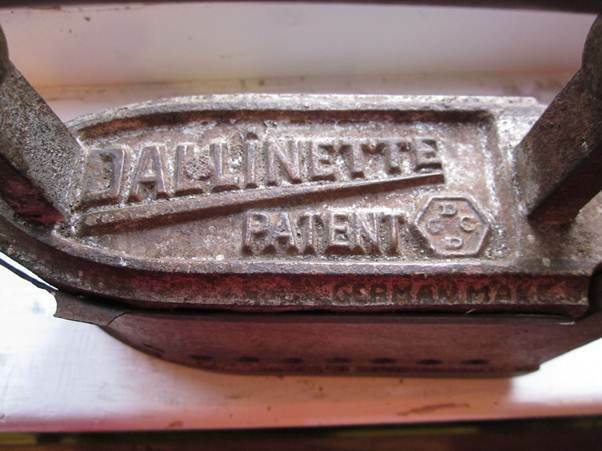 These irons, of German origin allowed users to open them up and put smouldering charcoal inside. This enabled them to maintain heat. A damper allowed some control over temperature by altering the airflow to the fuel. It was operated by the large knob at the back of the iron. The top of the iron opens to allow the fuel to be loaded and ignited – and then one iron was all you needed. Adverts made great play of this advantage over flat irons. 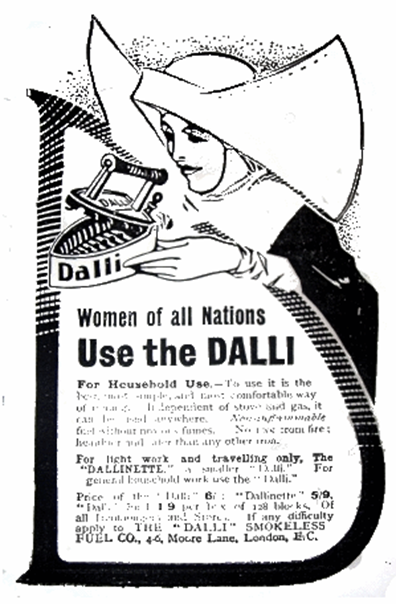 This advert is undated, but makes it clear that the Dalli was pure and perfect. It also indicates that our Dallinette was really for light work and travelling. 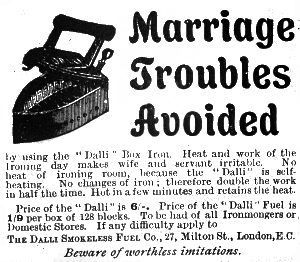 Another advert claims that the Dalli promotes peace and harmony in the laundry. In part this was because ironing could be done without a hefty and hot stove, needed to keep flat irons warm. The Dalli even solved marriage problems! Do take a look if you like old and interesting things. We think our Dallinette dates from about 1912. They were in production from the end of the nineteenth century until about 1930. In the days of the rich having servants, one of the jobs for the downstairs folk was to warm beds using warming pans. These items were often made of a copper or brass container with a long, turned wooden handle. Hot coals were put in the container. A servant could them push it between the sheets to pre-warm a bed before the occupants arrived. After the First World War, servants began to be found only in the homes of the very rich. But this was long before the time of central heating. Your average house probably had a kitchen range to provide heat for all. Bedrooms were cold in the winter. There’ll be many older folk who remember ice on bedroom windows. Did we all try to turn the random patterns in the window ice into imaginative scenes? Getting into bed in such a room was an unpleasant experience – so enter the hot water bottle. Here were the requirements. Such a bottle had to be waterproof and have an effective seal to hold in the hot water. It also had to be able to withstand the thermal shock of near boiling water being poured into it. Glazed stoneware met the requirements. Such bottles became standard household items and we have one at Market Lavington Museum. Stoneware hot water bottles were often referred to as ‘pigs’. Some say this was because the carrying handle – supposed to stay cool enough to manage, looked like a pig’s snout. 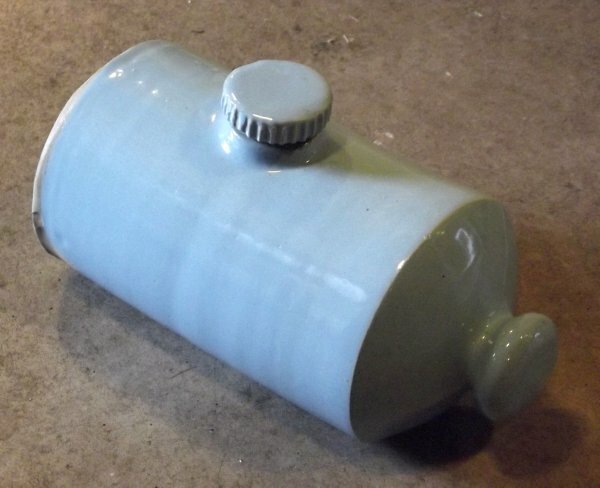 Others suggest that in Scotland, cylindrical, stoneware bottles were always called pigs, no matter what their function and we Sassenachs adopted the term just for hot water bottles. Ours has no maker’s name but is slightly unusual in having a blue outer glaze. We know almost nothing about it. It was given to the museum by a White Street lady and was categorised as mid-20th century. We think it might be earlier than that. The only marks tell us that it has a two pint capacity and there is a letter M also embossed in the base.